35th year of providing career readiness for young women through mentoring. L'Oréal USA celebrates 15th anniversary of support for New York Coalition of One Hundred Black Women's Annual Role Model Program providing mentoring and scholarships for young women in high school and college. 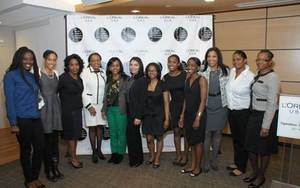 NEW YORK, May 28 /CSRwire/ - L’Oréal USA celebrated its 15th anniversary of providing support for the New York Coalition of One Hundred Black Women’s Role Model Program with four days of presentations and workshops culminating in the award of scholarships. The New York Coalition of One Hundred Black Women (NYCOBW) celebrated its 35th Anniversary presenting the Role Model Program, an initiative that allows young women to learn practical workplace skills and to shadow professional women in their chosen careers for one week during spring semester break. L’Oréal USA and NYCOBW hosted 28 college students and 11 high school students at its Fifth Avenue headquarters for four days of workshops and a special presentation on beauty designed primarily for girls and young women by Demeatria Gibson Boccella, Founder & Artistic Director / FashionAFRICANA. “L'Oréal USA is at the forefront of creating and supporting programs that empower women and girls. Since 1999, we have partnered with the New York Coalition of One Hundred Black Women to support the Role Model program. Our initial grant enabled the program to expand its reach beyond the borough of Manhattan, into Brooklyn and Queens, to students of Medgar Evers College and Queens College. We are pleased to celebrate fifteen years of sustaining a program that has positively affected the lives of hundreds of college and now high school students throughout New York,” said Antoinette Hamilton, L’Oréal USA’s Assistant Vice President of Diversity & Inclusion. “Today, through our 15-year partnership, we are proud to have contributed more than $320,000 to the Role Model program including more than $15,000 in grants and scholarships awarded annually to program participants,” Ms. Hamilton noted. "The Role Model Program, now in its 35th year, is a shining example of the impact that mentoring has on the lives and career successes of those who participate in programs such as ours. Past participants in our program regularly share with us the significant impact our program has had on their personal and professional development," said Avalyn Simon, President of the New York Coalition of One Hundred Black Women. Throughout the week, L’Oréal USA hosted workshops and presentations, a highlight of which was “Have A Beautiful Day,” a skincare, hair care and make-up presentation by professionals from L’Oréal USA brands Mizani and Maybelline Garnier consisting of mini-makeovers on the students, demonstrating great skin care as well as ‘how-to’ tips on creating a beautiful work look and extending the look into the evening. The featured speaker of the evening was Demeatria Boccella, Founder & Artistic Director / FashionAFRICANA, an annual production she created as a vehicle and voice for broadening the standard of beauty and cultivating a more life-giving and globally aware approach to African-inspired fashion and culture. As curator of GLAMAZONIA by Mario Epanya, Boccella collaborated with Cameroon-born and Paris-based fashion photographer Mario Epanya to present the multi-media exhibition - which features images of Black women with African-inspired hairstyles, garments, and accessories, and offers testament to African beauty. Ms. Boccella co-presented with Antoinette Hamilton on “The Beauty of Identity,” asking the participants to define beauty for themselves. As a part of the program, the students attended a specially curated "pop-up" exhibit of GLAMAZONIA created especially for the Have A Beautiful Day evening, featuring the work of Mario Epanya and created ‘Beauty Boards’ illustrating their personal interpretations of beauty. On day one the students were greeted by 2013 Role Model alumna and scholarship winner Carlene Bobb, a student at John Jay College of Criminal Justice; the young women got Dress for Success tips from Stephanie Grigg and Money Management tools from Coalition member and financial advisor, Monica Noel. The evening culminated in a 2-hour, hands-on demonstration of Dining Etiquette facilitated by L’Oréal’s Aleksander Kiprovski, Director of Food Services. Additional workshops included: “Keeping It Real” The Politics of Work and Life, featuring panelists psychologist Dr. Erika Woods; Raven Robinson, Founder and CEO Pr2Politics and a Role Model Program participant from 2012; 1990 Role Model alumna Zevilla Jackson Preston, a Registered Architect and Founder and Principal of her Harlem-based firm, J-P Design, Inc. which opened in 1993; Edward Bullock, former L’Oréal USA Vice President of Diversity & Inclusion, Amanda Clarke, Life style blogger for “ Six Inches & Higher” and Andrea Chilaka, a New York City based attorney and RMP mentor. Pearson said that many of the issues that disqualify candidates for employment are things that are repeatedly stressed, but often overlooked. For example, she said that it is important to submit a well-organized and thoroughly edited resume that shows that the applicant knows what the employer is looking for and how she/he can contribute. “I want my prize to go back into the Coalition. That will be my way of being a part of this organization because I believe so deeply in what you are doing and the message you are sending the young girls,” said Hjordy’s Perez-Matos, first place college scholarship recipient. Two recipients, Simone Michelle Jackson from CCNY and Simmone Isaac from John Jay College of Criminal Justice, were awarded the Evelyn Payne Davis Scholarship – named in honor of one of the Coalition’s founders and first President and awarded to students who have had to overcome many obstacles in their educational pursuit. The college students were selected from City College of New York (CCNY), LaGuardia Community College, Medgar Evers College, Queens College, York College and John Jay College of Criminal Justice. The high school students attended the Women’s Academy of Excellence in the Bronx or are members of the Xinos Group of the National Sorority of Phi Beta Kappa in Queens. To commemorate both the 35th Anniversary of the Role Model Program as well as the 15th Anniversary of L’Oréal’s sponsorship, women who participated in the program from as far back as 1988 returned to share the significance of the program to their growth and development. The Role Model Program is chaired by Cheryl Green-Foster, Second Vice President, Programs. Committee members are Elizabeth Carde, Barbara Kairson, PhD., Denise Branker, Laura Green, Sharon Long, Lakisha Odlum and Yvonne Sterling.